File Your Condominium Annual Depository Report Now! Have you seen the Division of Condominiums’ new website? You will find a new form seeking information that might make you uncomfortable to share, but sharing is required for Florida condominium associations. You may recall from earlier G&A Memoranda, a fairly new Condominium Act requirement mandates all Florida condominium associations to file an annual report with the Department of Business & Professional Regulation stating the name of all the financial institutions in which the association maintains an account. Select the “Financial Institution” name tab and add financial institution name. A more detailed reporting summary is provided on the Department’s website. It is important to note that this reporting requirement is not limited to residential condominiums. The requirement reads as including associations for commercial condominiums, industrial condominiums, and other specialty condominiums, as well as pre-turnover associations. Failure to comply with the statutory requirement may result in penalties including but not limited to letters of censure or warning, the removal of an individual as an officer of the association, prohibiting an individual from serving as an officer for a specified period, and monetary penalties. It is noted that several years ago there was a requirement, now repealed, that required associations to submit their year-end financials to the Division, and although many are hopeful that this requirement will be similarly repealed, until then condominium associations must comply. Thus, if your condominium association has not filed this information with the Department, then it is imperative that the association file the required information without delay! No Collection Shortcuts, No Security Blanket! What happens when assessment delinquencies increase, mortgage foreclosures spike, and associations have trouble paying their bills? Those serving as directors or managers during the 2007 “Great Recession” know that this is not just a hypothetical! Many worry that the future may bring a relapse. Have we learned anything from the past, or are we condemned to repeat it? As described in Federal National Mortgage Association v. JKM Services, LCC, Case No. 3D17-370 (Fla. 3d DCA October 3, 2018), the situation was severe. At the start of the Great Recession, assessments from 90 percent of the Cedar Woods Homes Condominium’s 165 units were delinquent. A majority of the delinquent units, at least 75 of the 165 units, were in foreclosure. As was to be the trend across the state, lenders were “slow to prosecute” their foreclosure actions because of the “safe harbor” statute contained in the Condominium Act §718.116(n)(b) Fla. Stat. (2014). Though this was a condominium association situation, the court’s rationale may easily apply to homeowners association. The condominium association petitioned the trial court for a receiver, ostensibly seeking to collect rents from leased units to substitute for delinquent assessments, but the association’s petition did not name as parties any of the owners of affected units or the units’ lenders. The appellate court held that in proceeding, the association failed to meet two basic requirements for a lien assessment foreclosure receiver. First, the receiver must follow an association lien foreclosure judgment. Second, the monies the receiver can collect is limited to rent from tenants. In striking down the appointment of the receiver, the appellate court also found that the association’s demand that a unit’s mortgage lender pay receiver fees was untenable. 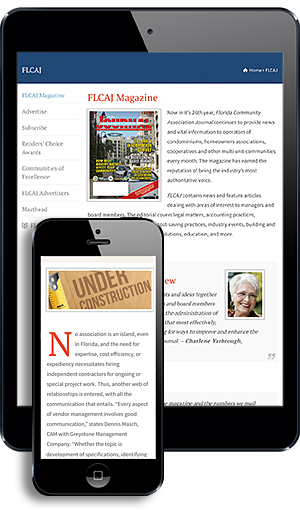 The appellate court made a number of rulings of interest to all Florida community associations. As a caution, the court held that the mortgage holder “safe harbor” is “clear” and “well settled,” limiting the payment of assessments to one percent of the original principal amount or 12 months of assessments. In this case, the safe harbor must be followed because FNMA was the mortgage loan purchaser and assignee of the final judgment from the mortgage lender’s servicer. Thus, where the safe harbor is clearly applicable, associations should not be seeking additional monies. Note, the decision does not force application of the safe harbor in situations outside the statutory limits, such as when a third-party obtains an interest in a mortgage foreclosure after final judgment, particularly when the transfer is not from a servicer. In addition, the appellate court reaffirmed the concept that there are many different routes to an association receivership. These routes include not just statutory receivers but also common law receivers appointed to address general matters such as waste. Florida community associations should not forget that they have another tool instead of a lien assessment foreclosure receiver. That tool is found in the statutes authorizing associations to collect the rent when a rented unit is delinquent in its assessment payments, bypassing the owner. Associations will want to confer with their counsel concerning their ability to undertake these efforts, especially in advance of any anticipated economic downturn.